Qeqertarsuaq was founded in 1773 as a whaling station. The city has 850 inhabitants and is beautifully situated overlooking Disko Bay. You can travel to Qeqertarsuaq from both Ilulissat and Aasiaat. In our opinion, Qeqertarsuaq is one of the most beautiful places in Greenland. Glacier covered mountains dominate the hinterland, but on the coast you’ll find strange basalt columns and an abundance of flora, with angelica being one of the most prominent. 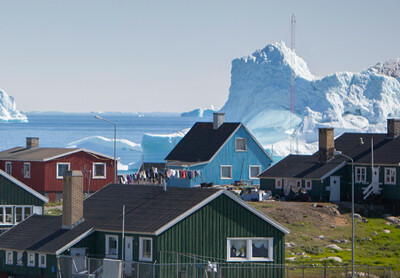 Qeqertarsuaq is one of our absolute favourite towns and certainly one of the most photogenic. The location is exceptional, neighbouring Disko Bay with huge icebergs and countless whales. 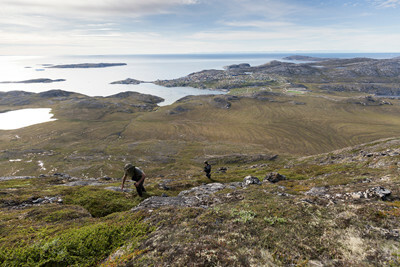 The island has a somewhat different landscape to the rest of Greenland – the hot springs and basalt pillars are evidence of the island’s volcanic past. Located in Disko Bay, Disko Island is Greenland's largest island. The Greenlandic name for the island is Qeqertarsuaq, which means "the great island". The island has only one city, namely Qeqertarsuaq (Godhavn) on the south side, and a smaller village Kangerluk (Diskofjord), located 35 km north-west. Many Greenlanders recognise Disko Island from a distance, with the island's characteristic basalt mountains of volcanic origin rising nearly 1,000 meters out of the water. In the south, the mountains are covered all year round by the ice and snow of Lyngmark Glacier. During summer you can go dog sledding on the Lyngmark Glacier under the midnight sun. It’s the only place in Greenland that you can do this. Disko Island is interesting for many reasons, not least because of the great diversity of flora. The island is situated between the low and high Arctic, and along with the occurrence of many hot springs, it provides a richer vegetation compared to other sites of the same latitude. The sea is also very rich around Disko Island, which generally means large numbers of whales. In the spring, the area is one of the world's best to observe the great Greenland whales. In Greenlandic it has the very meaningful name "Arfivik", which means "the barrel-shaped". In summer, humpback whales are often seen very close to the coast. A little north of Qeqertarsuaq along the coast, is the unique area called Kuannit. The place is extremely lush for Greenlandic conditions - almost neon-green with countless angelica plants in summer. The volcanic origin of the island is also manifested in the special basalt columns which dominate the area. It’s relatively high above sea level, so you can sit in the heather and enjoy your picnic lunch while watching whales in Disko Bay. The trip typically takes 3-4 hours return incl. a lunch break. The trip begins in the city, passes by the Arctic Station and later across Red River. Then the trail turns inland towards Blæsedalen. You can adjust the length of the trip depending upon how far into the valley you venture, but the duration is approx. 1-2 hours or up to 3-4 hours if you choose to go further into the valley. The outermost point south of Qeqertarsuaq is called "Lookout" or Qaqqaliaq in Greenlandic. As the name suggests, it is a great place to observe whales. The trip takes about 2-3 hours return at a slow pace. Do you have a dream to go dog sledding in Greenland during summer, where you can also experience the Midnight Sun? Well, your dream can be fulfilled here. It can never be compared to winter dog sledding, but it’s a good alternative for those who cannot come here in winter. The hike ascent is approx. 900 meters. It’s important to mention that this hike is difficult. On a scale from 1 to 6 this is rated around 3-4, where 1 is a city tour and 6 is hard mountain climbing. As one of the most beautiful hikes in Greenland, it usually takes 2½ to 4 hours each way. Once you reach the top, just enjoy it, because the return trip may be hard if you’re not in peak condition. If you have a bad back, knee or hip, you should carefully consider whether this is suitable for you. The tour starts at 9:00 hrs (9 am) with a briefing before departure. You’ll travel through the town towards Uunartuarsuk, where the track to Uunartuarsuup Sermia begins. Your guide will lead the way, ensuring everyone is safe. Lunch is served on arrival at the cottage by the glacier. Dog sledding takes place during the afternoon, lasting approx. 1 - 1½ hours. After a dinner consisting of Greenlandic specialities, you’ll be guided down from the glacier. NOTE! Like everywhere in Greenland, the weather and ice conditions dictate activities and transport. With safety of paramount importance, the guide and tour operators will decide whether the trip can be completed or not.